The "All-On-Four" technique was developed by Portugese dentist Dr. Paulo Malo, in cooperation with Nobel Biocare. This technique is a possible solution for patients who have too little bone left for dentures or conventional implants. As is illustrated by the x-ray (pictured at right four implants are placed in the front of the jaw, where the bone density is usually better. The implants are angled, to provide a more stable base for the denture to attach to. While the implants are angled, the portions of the implants that the denture attaches to are parallel, and point upward. This is so the screws that attach the denture to the implants can attach normally, with a stable, secure fit. 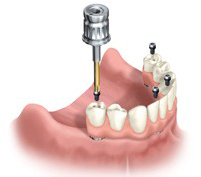 The picture above shows how the denture is screwed on to the implants. The All-On-Four approach is not for everyone, and absolutely must be performed by a dentist who is fully trained and experienced with this technique. Dr. Courey will help you decide if this is the right solution for you.